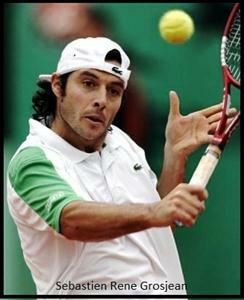 Sebastien Grosjean is a former male tennis player from France. He started his professional career in 1996 and retired on 27 May, 2010. A right-handed player with two-handed backhand he has won four singles titles and five doubles titles in his career. On 28 October, 2002 he reached his highest singles ranking of No. 4. He was born on 29 May, 1978 at Marseille, France. Grosjean started his professional tennis career in 1996. At the end of the year he was ranked 405 in men's singles ranking. In 1997 he participated in various important tennis tournaments including main draw in French Open tournament. He lost in the first round of the French Open. Year 1998 was more fruitful for him as he broke into the top 100 of the men's singles ranking for the first time in his career. His biggest achievement of that year was reaching the fourth round of the Wimbledon tournament that year. At the end of the year 1998 he was ranked No. 88 in singles. In 1999 he improved his singles ranking much more. In the Miami Masters of that year he was the finalist in the men's singles category where he lost to Richard Krajicek of Netherlands with a score of 6-4,1-6,2-6,5-7 in the final. His ranking rose to No. 26 at the end of 1999. In 2000, Grosjean won his first singles title at Red Letter Days Open held in UK. He defeated Byron Black of Zimbabwe in the final of the tournament. In 2001 he won the prestigious Paris Masters which was is also the only Masters title of his career. He also broke into the Top 10 of the singles ranking for the first time in his career. He also ended up as semi-finalist in French Open and Australian Open in 2001. In 2003 and 2004 he was the semi-finalist of the Wimbledon tournament. His form lost after 2006 the year in which he last reached to the quarter-final stage of any Grand Slam tournament. After his disappointing performance in 2009 Grosjen decided to retire from the sport and on 27 May, 2010 he retired from the professional tennis. Grosjean was also a good doubles player. His highest ranking in doubles is No. 52 which he achieved in 2004. His biggest win in doubles is at Indian Wells Masters in 2004 where he and his partner Arnaud Clement defeated the Zimbabwean pair of Wayne Black and Kevin Ullyett.